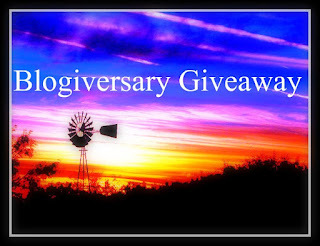 Texas Housewife: One Year Blogiversary Giveaway! My blogiversary is fast approaching. I posted my first real post on March 24, 2008. In honor of this momentous occasion, I've decided to have a giveaway. The big prize up for grabs is a "box of goodies" including at least 12 of my favorite things. Some things that are included are jewelry and soap from one of my favorite Etsy shops, plus more! I promise, it will be great! I am blessed to have some wonderful loyal readers, so this is my way of saying thanks for a great year! Okay, I've had some emails telling me this is too confusing, so I've reworked it a bit. *Comment on this post. Let me know about something you found helpful on Ramblings and/or something you'd like me write about more. I can't wait to hear your feedback! *Put my button on your blog or add me to your blog roll. *Become a follower of my blog. That's total of 11 possible entries. Just be sure that you leave me a separate comment here for each thing you did. Also, be sure that I have a way to contact you, either via email or your blog. There are also two smaller prizes up for grabs! One new follower will win a prize, winner will be selected by random drawing. The person who comments the most between now and the entry deadline will receive a prize as well. Deadline to enter is March 24! The winner will be announced on March 27.
just one helpful thing? your recipes! ooh or your money tips, ooh or the book reviews...I could go on! helpful thing-----i love the recipes! and the tamale soup was the best. and i just blogged about it. oh i also mentioned it on SITS roll call too! I know, blatant sucking up! I love recipes too. I love trying new recipes often. Thanks for the great blog and giveaway! Happy Blogiversary! My blog is in its infancy, so you have done well in your time. I always LOVE recipes, so the more you post, the better. I also am increasingly in want of FRUGAL tips. The economy is really hurting us, so your tips are welcomed and appreciated. So thanks for the recipes! Hope I win, I'd love a surprise package with Etsy things in it! I must agree! The recipes are awesome. I'm going to be making your Spanish Rice tonight. It sounds so good and easy. Both of which I like. Thank you! And I really like the recipes. They are great! I too love your recipes. I like to try something new every now and then. Congratulations on your blogeversary. I'm new at blogging and don't have one of my own but am thoroughly enjoying reading your comments. I like your money tips. i love the cheap and easy recipes...two words that are very important when it comes time to make dinner!! all i can say is - keep em coming! Awesome Giveaways! I would love more book reviews and recipes! I'm all about saving money, so the tips on money saving are my favorite! What are you thinking of writing tonight? I wonder if anyone else likes an elephant! Love to read about something funny! Thanks and Irish wishes to you, Lots of luck and happiness too! your button is in my blogroll! I always love your recipes! I don't have a kitchen in my apartment so I can rarely follow through on them, but I print stuff out so that when I have a better apartment (with a kitchen!) I can put to use some of the great recipes I find. i am a secret lurker but the recipes are great! I always love to try new recipes, so more of those would be great. I like the fact that you have pictures of your family on the side of your blog. It's nice to put faces with names. I also like your recipes, especially the cheap and easy ones like Crock Pot Carne Guisada! I am new to your site and look forward to coming back more, I will pick the receipes and for my second i'll say reviews. i love all your yummy recipies!! i have been a lurker for awhile, but i love your recipes and anything having to do with being frugal! thanks! I love the recipes! I have been a lurker... OK.. gonna bite the bullet and Follow... its about time I got around to it!!! I am new to Ramblings...just cruising around reading different things...read aloud to my four year old that a McDonald's ran out of nuggets...he thought that was a VERY GOOD reason to call 911! i'm new here, just came over from SITS. but i am looking forward to getting to know you + reading more! I'm also a new reader, but your Momma Mia post totally made me smile! That song cracks me up too! I am a new reader, but I love your recipes! What a fun blog!! I totally ♥ your layout and background!!!! So original!! Come on over to my blog to register for my pearl earring giveaway too!! What a great giveaway. Very exciting to get favorite things :) I lov eyour recipes. Keep them coming! I love the recipes - I get so bored with my own cooking. Love your recipes and giveaways! Thanks so much!! I know it's been said already, but I like the recipes. Also, the money saving tips are helpful. I just found you, but I love that you have lots of links on your side bar! I love finding new places to visit! New here. Gonna check out that tamale soup recipe. First time on your site but I will definitely be back for some of those yummy sounding recipes. This is my first visit here but I'm a big fan of easy and frugal recipes. I'm new to your blog, so I'm not too familiar with it yet, but I'm always looking for good recipes! I'm new, BUT if your from TEXAS it all must be good, make that great-love your layout, add me in! Thanks SISTA! The recipes are great. You have a very nice informative blog. Thanks for the chance to win! i am new to your blog. i love surprises!! Love your recipes and would like to read more about gorcery store bargains or a weekly meal plan. Just arrived from SITS, happy anniversary!! 12 things what fun and a surprise box coming in the mail is just what I'd love! Enter me please and happy blogisversary! new visiter via SITS! HAve a good day! I would have to say recipes. I love recipes. Great blog & giveaway! Recipes are good. happy Blogiversary! looks like I am just one of many that loves a good recipie! I love your recipes. They are yummy and very helpful. I would love lots and LOTS of recipes. ;) Love the denim look too! The recipes look like my favorite! I'm finding all kinds of interesting blogs while flipping through SITS. I might have to quit my day job to read all of them. Well, I've never been here before, but I'm sure you are super duper helpful and I look forward to coming back and finding out more about you. I just found your blog, so I can't say what I found helpful, but with the short peek around that I took I can say I'll be back for more. I am fast becoming an Etsy addict so I'm interested to see what you'd include as your "favorites." Maybe you could list your favorite shops/artisans on Etsy. I love Etsy and love surprises! I would love to have my hands on those goodies! Please count me in and Happy Blogniversary! Here's to more years of blogging to come. Cheers! I just came to your blog via the Spring Fling. Let's see, something you could help me with...at the moment my stubborn 20 month old daughter is screaming in her bed and refusing to go to sleep. You'd think I'd have mastered this by now, with her being my 3rd child. But girls are sooo different from boys! What a fun giveaway. I would love to win! I am excited to look around. It sounds like your recipes are fabulous! I'm a new reader, but I was just checking out your recipes section and the recipe for cheese straws sounds amazing! I'm gonna have to try those this weekend. Thanks for the giveaway! Hi there, found you via SITS. I just added you to my blogroll, thanks! I'm new to your blog...but I already love some of the recipes I found! I subscribed to your blog's RSS feed on Google Reader. Christina - xristya@rock.com - I love the recipes, and would love to see more book reviews - thanks for the wonderful giveaway also! I love your blog. The setup is great. I'm new to your blog but will be back lots. Recipes seem yummy. Good work. I am a subscriber in Google reader. I like your recipes! I'm a lifelong-vegetarian and my boyfriend is, well... not. I'm new to cooking with meat, and I enjoy finding doable, affordable recipes that he'll like. Love your blog! Always love to see more contests and ways to save $$! I like the book reviews and your layout! The money saving tips are important to everyone in these uncertain economic times. I love the money saving tips. Love money saving times, something we all need during these difficult times. I'd like you to write more about asking your readers for their opinions on 'what should I do', or 'which would you pick? ', things like that! Vanessa, your sense of humor is hilarious and quirky!! My cat was giving me bizarre looks as I was lol'ing while reading your story about the child asking "let me see your uterus"!!! rofl! You've got a great writing talent! Thank you for the contest! I haven't been reading your blog very long, so don't feel that I can really comment on what needs to be changed/added, etc. I do enjoy humorous stories, and almost any family can provide a large number of them. Congratulations on you Blogoversary! I ama follower of your blog. I'm always looking for ways to save (and make) money, so your frugal tips are my favorite thing -- if I have to pick one! I just found your blog, and I'm impressed by your recipes - many of them have an edge that's just a little bit different (to my Yankee palate). I'd like to see more recipes like Bierocks - it seems very different to me - and, if possible, I'd love to see some pictures of the food (don't fancy them up...I like food photos to be just like you serve it at home). Hope you're not sorry you asked! I like the recipe section, especially since they are easy to follow (I am learning how to cook). I like "What's Cooking" section and recipes. The recipes are my favorite. More giveaways would be great, too. we tried your quiche recipe. It was good. Even the kids liked it. LOL. Maybe you could add even more recipes for slow cookers maybe. I am new to your site-I enjoyed reading about migraines! right now i need stress reliever tips. I like the Zesty Crock Pot Pork Chops recipe and plan on making them. I love the recipes. I am always looking for new things to make. I can't wait to try the Carne Guisada in the crockpot! YUM! I love the What's Cooking section. There are some great recipes posted. Definitely the recipes, I'm always searching for new recipes! I'd love to see updated versions of classic recipes. I like the recipes and housecleaning tips. I subscribed to your blog also! Happy Blogiversary! One Year is quite an accomplishment! May you have another fun and happy Year! I was really intrigued by your post about the Total Focus program. I too have a son with ADHD and I would love it if you keep posting on how this program is working for your family. I know you are only 1 disk into the program so I think blogging about the program and the effects it is having would be interesting to read about. I hope you make progress in handling Tristen's ADHD and thank you for sharing your initial feelings about it. All my best to you and your family! I am Subscribed to your blog too! I am new but keep up the good work! The recipes are very inspiring. I love finding new recipes, especially spicy ones and those from other states and regions and Texas has some great ones! Thank you so much! Fun? How your site looks! !Love your denim background and all the "country" type illustrations. I'm a newbie that just signed up for your newsletter!!! Love your site and so glad I found it!! Like your wkly menus and may have to steal a bunch of your stuff!! LOL Thanks. I love your color scheme, it matches well with your image and is easy to read. I'd really like for you to write about Autism in April, as it is Autism Awareness Month and there is never too much awareness! Your recipe for Crock Pot Carne Guisada was great. I would love to see more recipes! Cheap and Easy recipes are my faves. Especially easy!! I've found your recipe section most helpful and I'm putting the ingredients of the Zesty Crock Pot Pork Chops down on my shopping list to cook for dinner one night this week. Thanks for a great giveaway! I think that you need to have more contest. Wow, another 365 days about to come up and go. I really like your recipes.